Sameer Srivastava, a school topper from Meerut in Uttar Pradesh, wanted to study in an IIT like any other engineering aspirant. But getting into an institution where only less than one percent of the applicants are selected was a big hurdle. Not cutting the IIT mark, Sameer decided to settle for an engineering college, which with its traditional curriculum and teachers was just good enough. After completing his four-year BTech course, Sameer got a job that paid him only Rs 7,000 per month. Not losing hope, he decided to upgrade his skills in the field of big data and analytics and enrolled for a free online course. On completion of the course, he got a job with a leading tech company, TCS, paying him more than double his previous salary. Sameer’s story is an inspiration to many who feel that their world has ended on failing to get into the IITs and IIMs. There are 6,214 engineering and technology institutions in India, which enrol 2.9 million students, according to the ministry of human resource development (MHRD). Every year, eight lakh engineers pass from technical colleges, but of these only 40% are able to get jobs, according to the All India Council for Technical Education (AICTE). Moreover, a study conducted by an employability solutions company, Aspiring Minds, on 1,50,000 engineering students found that only 7 percent are suitable for core engineering jobs as most of them lack employability skills. A few years back information and communication technologies like virtual classrooms and online tutorials were introduced into the education system as a means to make quality education affordable and accessible to all. The government launched various projects such as National Programme on Technology Enhanced Learning (NPTEL) and National Mission on Education through Information and Communication Technology (NMEICT) on this front, but lack of infrastructure and awareness limited their success to the grassroot level. But one cannot deny the way in which ICT intervention in pedagogy is re-engineering the education sector in our country. With nearly 10 lakh vacant posts of teachers in schools and higher educational institutions in India, according to MHRD, ICT can play a major role. Though, MOOCs have been around for more than five years, it is only in the past one-and-a-half years that the enrolments have gone up. Easy accessibility to the high-speed internet on mobile phones and an increase in demand for skilled workforce have acted as the prime factors. Coursera and edX are among the top global MOOC providers. edX offers more than 1,330 courses from over 110 global institutions, whereas Coursera has partnership with 146 of the world’s universities and offers over 1,700 courses and more than 160 specialisations. From over 10 million global learners at edX, 1 million are from India. Coursera, on the other hand, has more than 23 million global learners, of which 1.8 million are from India, overtaking China to become the second-largest market for the company. “Over the past one year, we have seen a remarkable 50% growth in our learner base in India. Our university partner in the country is the Indian School of Business,” says Arunav Sinha, head of global communications, Coursera. Many private firms are also using MOOC platforms for training employees to enhance their skills. Coursera has partnered with Axis Bank and Manipal Global Education Services in the country. Not only corporate, but governments across the world are also using MOOC to fill the skill gap. The governments of Egypt, Kazakhstan, Malaysia, Mongolia, Pakistan, Singapore and the United States have partnered with Coursera for skills development. India on its part started an indigenous portal, Study Web of Active Learning by Young and Aspiring Minds (SWAYAM), in 2015, that offers free online courses. Developed by the MHRD along with AICTE and Microsoft, SWAYAM provides around 300 courses ranging from school, undergraduate, certificate, diploma to post-graduation levels. The courses can be accessed through the SWAYAM website or its mobile app. The department of technical education under MHRD is also planning to make these courses available in 10 regional languages. At present, the courses are available only in Hindi and English, that too for a limited period. Seven national coordinators have been appointed to oversee the quality and delivery of content. A national level agency, National MOOCs Coordinator (NMC), has also been set up to coordinate the production of these online courses and oversee their quality. Currently, SWAYAM is in a trial stage and needs many upgrades to reach out to the masses. Meanwhile, edX has collaborated with many Indian universities like IIT Bombay and BITS Pilani to offer job-ready skills. But the big question is whether such online platforms substitute mainstream education? “This is not our objective,” answers R Subrahmanyam, additional secretary - technical education, MHRD. “We are promoting it as a blended learning opportunity. Those who do not have access to quality education can benefit from this,” he adds. However, many a time quality of education rendered on these online platforms has been questionable. Good teachers are needed to keep the learners engaged throughout the completion of course. It will also keep them interested in the course and increase their yearning to learn more. Moreover, there is a huge discrepancy between the enrolment and completion rates of online courses, where the world dropout average is more than 90 percent, as per some reports. 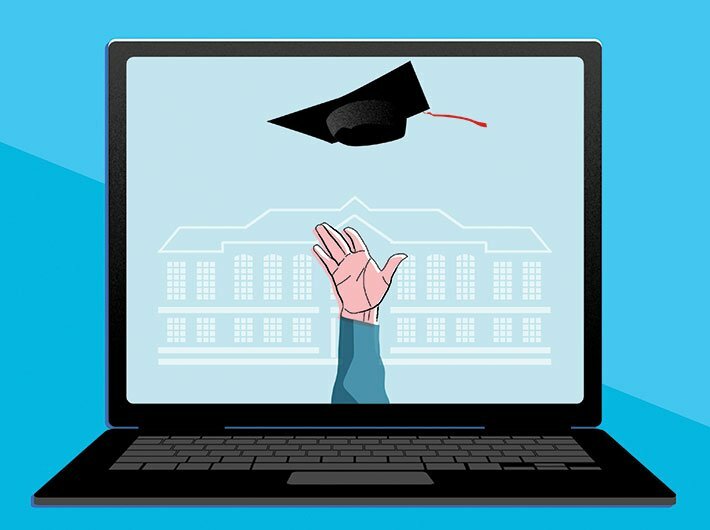 Coursera claims that they see “a 50-60% completion rate among our learners who pay”, while the completion rates for edX varies from “5% up to 80% per course”, which depends upon the course subject, whether the student is an active learner, and whether he or she is enrolled in a verified certificate or credit track. SWAYAM has seen about 45,000 enrollments, but the dropout figures are not available as the platform is still in a beta stage. This inconsistency is mainly due to pedagogy and credit system. Many people join the course and leave it midway. “I got bored after going through a few lectures from one of the premium tech institutions of the country,” said one of the learners. One of the reasons of high dropouts can also be that such online courses do not address social and emotional needs of a person. Peer-to-peer interaction and real-time feedback from teachers is missing, says Dr Veera Gupta, associate professor, National University of Educational Planning and Administration. Yes, they play an important role in retaining the learners, says Pradeep Kaul, senior consultant, NMEICT, on the need for quality teachers and interactive platforms. “Realising this, we have chalked out a mechanism to identify good teachers. We are also working towards making 24-hour student-teacher interaction. We are also working on weekly assignments and continuous teacher feedback to improve the quality of courses,” adds Kaul. Another problem which many face with the online education system is that the course certifications and credits are not transferable to Indian or international universities. However, in July 2016, the University Grant Commission (UGC) notified ‘UGC (Credit Framework for Online Learning Courses through SWAYAM) Regulation’, under which credits earned from courses are transferable for enrolment into regular or part-time courses in any educational institution of India. However, there is a rider. “You can pursue any number of courses [from SWAYAM] but only 20 percent of the course’s credit can be transfered in one session,” says Kaul. Private platforms like Coursera and edX, on the other hand, do not provide credit transfer facility. Also, though most of the online courses are free, their certification comes with a price tag. Certifications of these courses are available in form of credits, which can cost a bit less than on-campus education. Credit fee of these courses varies depending on the university/college, kind of course and platform. Even the SWAYAM platform plans to charge a fee for certification after their official launch, which is expected in another three-four months. Fortunately Sameer got a good job without having to buy the certification, but not all are as lucky as him. Online companies claim that they charge a very nominal fee for the certification but credits for some courses can burn a hole in one’s pocket. For instance, Coursera offers most courses for free only on a seven-day trial period. If someone wants to continue the course they have to shell out some Rs 3,483 per month for credits. On the other hand, edX does offer learning material of courses for free but charges anywhere between $25 up to $900 or more depending on the university and course for certification. Defending their stand on the pricing strategy both Coursera and edX argue that the fee charged by them for credits is any day lower than a traditional university would charge. “Career-centric specialisations (series of courses that result in a certificate) are available on subscription and take three to five months to complete. The specialisation subscriptions typically cost between Rs 2,500 and Rs 5,000 per month. This cost is a fraction of what a traditional university would charge for the same course,” says Sinha from Coursera. Humans are gregarious, therefore, to make MOOC serve its purpose better, it is important to address challenges like good teachers, peer interaction, real-time assessment and credit mobility and not just infrastructure, connectivity and pricing issues.